PHENOMENAL BLAZER! A very rare grade condition for this mint and year, this Franklin glows in the dark with its blast-white surfaces. Haze-free, white-gold obverse and reverse are absolutely breathtaking with their heavy luster that completely smothers this Franklin! Nominal bag marks for a normally extremely baggy year, this example is in rare, pristine condition. Breathtaking eye-appeal and solid bell lines for the cherry on top! 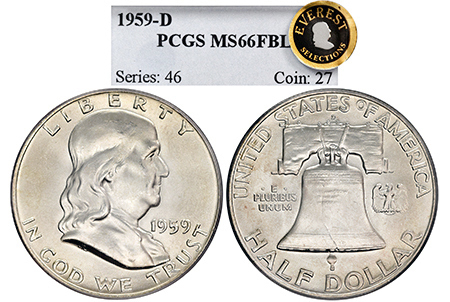 PCGS has only certified 151 examples in MS 66 FBL.